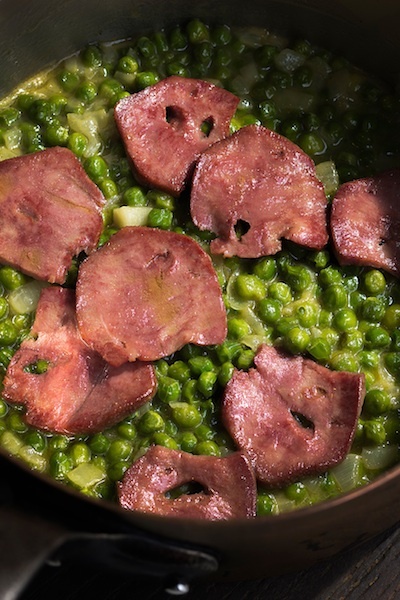 This is my variation on the classic combination of sweet, fragrant peas with a chewy, savoury, salty cured meat, the British version being pea and ham soup. If you use ox tongue as I urge you to, refer to my Pickled Ox Tongue recipe for a fantastic pressure cooker method for cooking tongue. Along with the method of cooking, you will find a perfectly good and repeatable in mixed company, tongue joke. Please try both. I like to use an oven-capable, wide fry pan that’s attractive enough to take to the table. Sweat the onions in butter with the salt and a splash of water to keep them from frying. In with the peas, chicken stock and the white pepper and let simmer gently for 5 minutes, without letting the liquid evaporate. Next, add the cream and continue to simmer for a further 2-3 minutes. You need to watch and asses at this point. The peas should be quite soft and the liquid should be verging on sauce consistency. Increase cooking time or add water or both as required. Check for seasoning also. Finally, brush tongue with the olive oil and place on top of the peas and pop into a 180°C oven for a few minutes to warm through. Bring out to serve with fresh bread for mopping up the juices.